Gates 6761 Powerated V-Belt (3L610K). 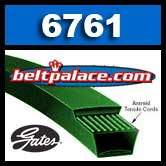 Gates 6761 Powerated V-Belt. Aramid/Kevlar construction (3L610K). Ideal for demanding lawn and garden or outdoor power equipment.